The other day I fell flat on my face. Literally. I was rushing across a street in an unfamiliar neighborhood and BAM! Blood was dripping from my lip. My mind began flooding with negative thoughts. Some of the thoughts shocked me. Letting those painful thoughts float away would help, but often, we need something more. The thoughts I was hearing hurt as much as my throbbing lip and wrist. I felt embarrassed and humiliated on top of the physical pain. But I knew what to do. First, put some pressure on my bloody lip and make sure my body was okay. Next, I had to perform triage on my mind and heart. Cognitive tools help and I would use those eventually, but what my most urgent need was compassion. Compassion is useful for all kinds of hurt, not just the embarrassment of falling flat on your face. The steps outlined below are useful for shame, guilt, fear, sadness, humiliation, worry, and for times when you’ve made a mistake or another person has acted or spoken unkindly toward you. Hurts build up. It piles on if we don’t do something about it. This pain blocks our aliveness, our joy, and our energy for life. Take a few moments to heal hurts soon after they happen. Below are 4 steps to heal yourself when you’re hurting. This is the process I use and teach clients to heal emotional pain. The hurt may be from a current experience like falling down and then having your mind go wild with blame or a mistake that was made. You can also heal painful past experiences that you keep returning to. These steps are SO powerful and I highly recommend them as a regular practice in your life. I also recommend teaching this process to your children. This is a combination of tools I’ve learned and modified with The Self Compassion Break created by Dr. Kristin Neff. I highly recommend Dr Neff’s book, Self Compassion: The Proven Power of Being Kind to Yourself. What I’ve found, is that sometimes I need all of the steps together and in order, and other times a single step heals. If you’ve ever been directed to ‘love yourself’, or someone has said, ‘don’t be so hard on yourself’, you may have thought, “But how do I do that?” This is how. Attend to the Hurt: When you’re feeling hurt from a current or past experience, be mindful of what’s happening in your mind and body. Refrain from blaming yourself or others for the experience that caused the pain. Notice what’s there: the thoughts in your mind, the sensations in your body. Now say a phrase like this to acknowledge the pain you’re feeling: “Ouch. This hurts. I’m stressed. This is so hard.” If none of these phrases resonate, come up with a phrase that fits for you. Connect: Everyone suffers at various times in their life. This is a universal human experience. Someone, somewhere has felt what you are feeling right now. Their experience may be similar to yours even if they are far across the world. The point is: You are NOT alone. Say a phrase like this to remind yourself that you are connected and not alone: I am not alone. Others have felt the way I feel now. We all struggle sometimes. Every human feels emotional pain. Healing Touch: Studies prove that touch heals. Oxytocin – the love hormone – is released with kind and gentle touch. The key behind the healing is the intention with which the touch is given. Think about caring for your child: hugging them, or stroking their cheek. You do it with the intention of giving love. A kind embrace or touch given to ourselves with the intention to soothe and heal does the same thing! 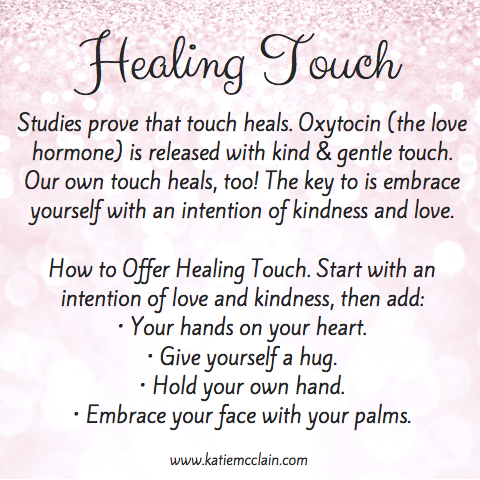 How to offer yourself healing touch: Start with the intention of love and kindness then try one or more of these: Place your hands on your heart. Give yourself a hug by crossing your arms and placing your hands on your shoulders. Hold one hand with the other. Embrace your face with the palms of your hands. Kind Words: Receiving kind words from others is lovely. Offering ourselves kind words is just as lovely and is a great way to heal ourselves when we’re hurting. 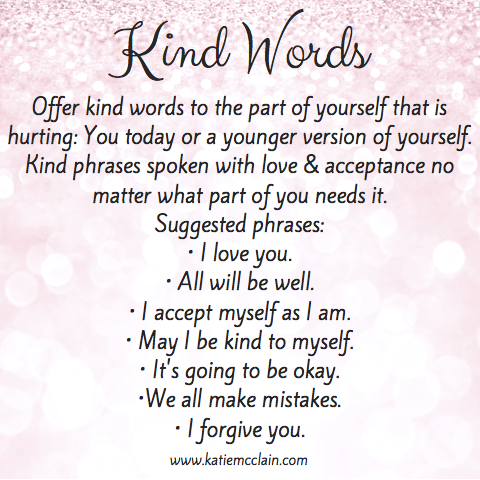 Speak kind words to yourself (in your mind or out loud) and be sure to do so with loving, kind, and/or forgiving intention. If you’re feeling hurt from a past experience, direct the words to yourself at the age you were when the experience happened. Examples: I love you. All will be well. I accept myself as I am. May I be kind to myself. It’s going to be okay. We all make mistakes. I forgive you. If these phrases don’t resonate, choose one that fits for you. Make sure that it’s kind! The steps are paraphrased into the 4 images below. Feel free to print them and keep handy for when you need a little kindness. Be kind to yourself. Teach your kids to be kind to themselves, too.